The East entry to Lawrence Hall will be temporarily re-routed while Terra Firma Foundation Systems is on site making necessary sidewalk repairs. The East entry will remain accessible for emergency egress only. Please see below diagram for the work area. Use caution in the yellow area. There will also be intermitted low-level noise during this work. For questions or concerns please contact CPFM Facilities Services Landscape Supervisor Phil Carroll at 541-246-0031. As part of the Volcanology Project, the North Entrance and North Stairwell will be temporarily closed October 31 – November 1 to allow Electricians to replace light fixtures in the North Stairwell. The other three entrances will remain open. Please use the East ADA ramp, South Main Entrance or the West Main Entrance. For questions or concerns please contact CPFM Project Manager Bruce Budzik at bbbudzik@uoregon.edu or 541-3466-8834. Beginning Tuesday, June 12th, and ending Friday, June 15th, there will be contractors on-site at 1715 Franklin to replace a section of the stairway located at the East Entrance. During this time the exterior ramp will not be available for use. Please use the North Entrance until the work is completed. For questions or concerns, please contact CPFM Real Estate Property Coordinator Melinda Seeley at 541-346-5550. The East Entrance exterior stairway has cones and caution tape put out due to this section of the stairway needing repaired. More information will be distributed as it becomes available. For questions or concerns contact CPFM Real Estate Property Coordinator Melinda Seeley at 541-346-5550. This notice has been sent to all UO Spaces building contacts in Oregon Hall and Outlook Lists FS Memo and Computing Centers. Fortis will provide power to the air compressor and monitor the sump pumps. This shutdown should not affect the data center. For questions for concerns, please contact CPFM Design and Construction Owners Representative Patrick Mucker at 541-346-8216. As part of the Knight Campus Project, our utility provider NW Natural has requested a series of work zone notifications redirecting pedestrian, bicycle, and vehicular traffic. Please expect noise and congestion in these work areas. Service and emergency vehicle access only. Service vehicles are encouraged to use alternate routes. Lots 3A and 3B will remain open, but access may be delayed. Parking in Lot 4 and 56 is encouraged. Late March parts of Millrace Path will be closed to pedestrian and bike traffic. For questions or concerns regarding how these activities may impact access to your buildings or research, please contact CPFM Design and Construction Project Civil Engineer Sarah Follett at 541-346-8264. This notice has been sent to all building users. Please contact CPFM Design and Construction Owners Representative Patrick Mucker 541-346-8216 (office) 541-517-2497 (cell) with questions or concerns. 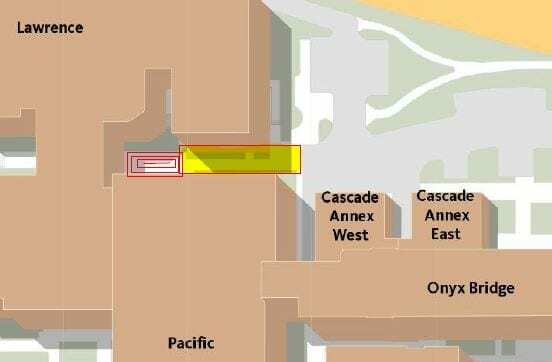 The Lillis south entrance will be closed March 27th – March 31st to demo existing tile and replace with less slippery tile. For questions or concerns about how this may affect your service, contact Kevin Farthing Zone D Maintenance Manager at 541-346-2857.